State officials in Minnesota say they are having a hard time fighting the spread of chronic wasting disease (CWD). A deer with the illness, also known as “zombie deer disease,” was recently found in Mississippi. CWD, which is spread by misfolded proteins known as prions, hasn’t been known to infect people. But researchers have warned that it could. A strange illness called chronic wasting disease – or “zombie deer disease” – is on the move, with officials in several US states issuing warnings. Currently, the disease is found in animals like deer, elk, and moose. 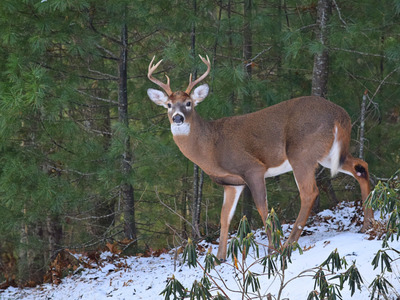 It can take up to two years before signs of CWD become visible, but at some point, the illness will cause an infected deer to lose weight, stop interacting with other deer, and lose its fear of humans. The animal winds up staring vacantly as it starves to death, which is why the illness is also known as “zombie deer” disease. Many animals are killed by predators or other diseases before they get to that final stage. But the condition, which is caused by the spread of misfolded proteins called prions, is fatal. As far as we know, no human has ever been infected with chronic wasting disease. But researchers are concerned that if enough people eat infected meat from deer, elk, moose, and other CWD carriers, the illness could start to infect people. In the US, CWD has now been found in 23 states. In Mississippi, an infected buck was recently discovered for the first time, according to local news reports. Officials from Minnesota’s Department of Natural Resources have been encouraging hunters who own land in places where the disease is prevalent to harvest more deer so the carcasses can be tested, according to a report in the Star Tribune. Any new discovery of the disease, like the one in Mississippi, can indicate that more animals are infected. After a case was identified in Arkansas in 2016, dozens more were found in the following months. The Minnesota Department of Natural Resources is attempting to reduce deer populations in infected areas. A DNR official told the Star Tribune that killing potentially affected deer could help the state stamp out the infection and avoid the rise of well-established infected populations like the ones in neighbouring Wisconsin and Iowa. A primary reason that officials are worried comes from the preliminary results of an ongoing study by the Alberta Prion Research Institute. The findings showed that macaques, the primates most similar to humans that can be used in research, can catch the disease after regularly consuming infected meat. CDCAs of January 2018, there were 186 counties in 22 states with reported CWD in free-ranging animals like deer and elk. Researchers noticed chronic wasting disease about 50 years ago in Colorado. Since then it has been reported in neighbouring states, areas around the Great Lakes – including Wisconsin and Michigan – and Canada. Prion illnesses are often progressive and usually fatal, and scientists think they can adapt to infect different types of species – including, potentially, humans. But they’re not well understood. Mad cow disease, a similar illness, became a problem after cattle ate bone meal from sheep with a neurodegenerative disease. The illness eventually made its way into the human food supply and caused a new type of Creutzfeldt-Jakob disease, which causes rapid brain deterioration. For now, some experts recommend that hunters who harvest deer and elk in affected areas get a sample tested before grilling up any venison steaks, and discard the meat if it tests positive for the disease.